Mactan Island Cebu's sole Waterpark facility is in the Palace - The Imperial Palace Waterpark Resort and Spa features 3 Slides among its five themed pools. The breathtaking Space Bowl is the main attraction in the waterpark vis-a-vis with Captain Hook's Pool, flowing Amazon River Pool, artificial tide pool Wave Rider, the Beach Pool and the Pool for toddlers. The Imperial Palace Filipino cusine restaurant, Cafe Amiga serves local and regional specilaties in a la carte menu of fresh and local ingredients. In the Cebu leg of Unilever Food Solutions Sooo Pinoy Food Trip, Cafe Amiga at the Imperial Palace is one of the participants where Executive Sous Chef Russel Abarquez demonstrate to us Molecular Gastronomy techniques in its Filipino dishes. 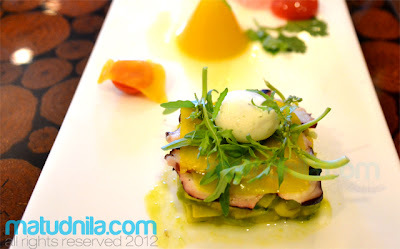 I am lucky to listen to Chef Russel explaining how Molecular Gastronomy works in his prepared dishes namely Sisig Embutido, Guava Foam and Guadalupe Mango Sheet and Octopus Tentacles, Avocado & Coconut - kesong Puti Spheres. Guadalupe Mangos are locally harvest in Cebu. 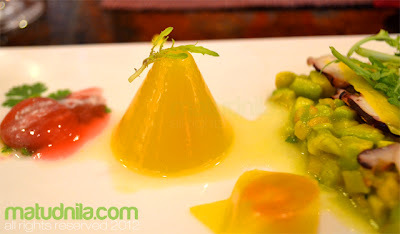 Molecular gastronomy is a Discipline of Food Science that make practical use of the physical and chemical transformations of ingredients that occur while cooking. These Filipino dishes is amazingly presented to us by Chef Russel. Other Chefes called the technique as Culinary Physics or Experimental Cuisine. Chef Russel's Embutido uses the renowned Sisig stuff with Cebu Chorizo and Boiled Quail Egg with guava sauce and Mango Jelly. Cafe Amiga's Sisig Embutido is also served with Ensaladang Octopus Tentacles & Avocado with miled-spiced Cocnut Kesong Puti dressing. UFS Sooo Pinoy Food Tour will discover the best of Pinoy fares in the best local restaurants, to know more about the Sooo Pinoy campaign, liked the Sooo Pinoy page on Facebook or follow @SoooPinoy on Twitter. 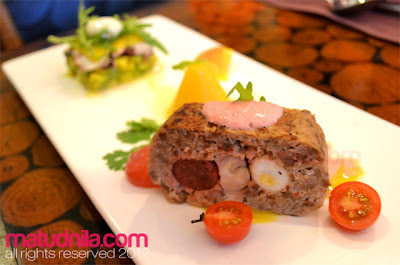 0 comments: on "Sooo Pinoy Food Tour Cebu: Imperial Palace Resort Molecular Gastronomy"